The early life of Frederick Alexander Jones has not been traced although, according to records dated 1939, he was born on 22 February 1879. Frederick's marriage to Hilda Millicent Rose Longney (née Shill) was registered during the first quarter of 1918, the year he was listed as an absent military or naval voter, living on The Green. Hilda was the widow of Glenville Charles Longney who had tragically died following an accident at the Slimbridge munitions store in 1916 (see our book Frampton Remembers WW1 for more details). In addition to Hilda's own children, the couple had a further child, Leonard, on 29 December 1919, who is seen with his parents in a photograph in our Gallery. 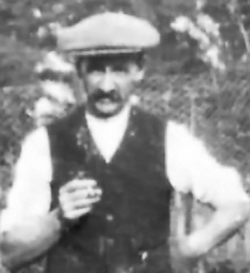 Frederick and Hilda later moved to The Lake, Frederick working as a farm labourer. Frederick Alexander Jones was buried in St Mary's churchyard on 4 March 1958. It has not been possible to find details of Frederick's service during the war, and he is not among the men remembered on the plaque in the village hall.